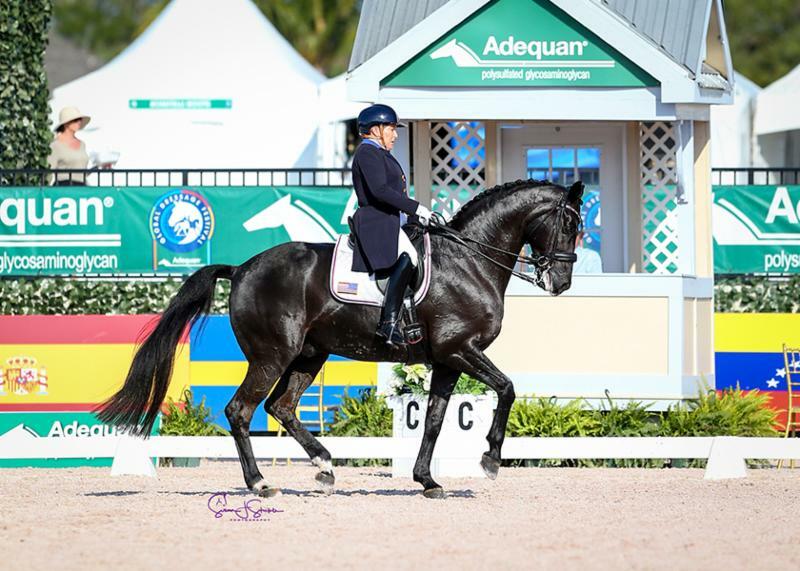 Betsy Juliano’s Handsome was unstoppable in the small tour ring with Jennifer Baumert during Week 10 of the Adequan Global Dressage Festival held March 14-18, in Wellington, Florida. The pair have been on a hot streak this season, with three victories in the Prix. St. Georges (70.44%), Intermediaire I (72.59%) and the Intermediaire I freestyle (75.20%) bringing their total win tally for the season up to 10. Jennifer Baumert and Handsome swept the small tour. Photo by Susan J. Stickle. Handsome, a 13-year-old Hanoverian (Hochadel-Wyona K, Weltmeyer), is owned by Elizabeth ‘Betsy’ Juliano, who bought him four years ago in California from Marie Meyers and used to ride the gelding herself. But she handed the reins over to Baumert almost 18 months ago. “I’ve owned Handsome close to four years, but the main reason I stopped riding him is that he’s really talented, and I felt he needs a rider who has equally as much talent,” said Juliano. “I also became very busy with my work. I own a litigation support and management business that I started 35 years ago, and that has kept me away from riding consistently. 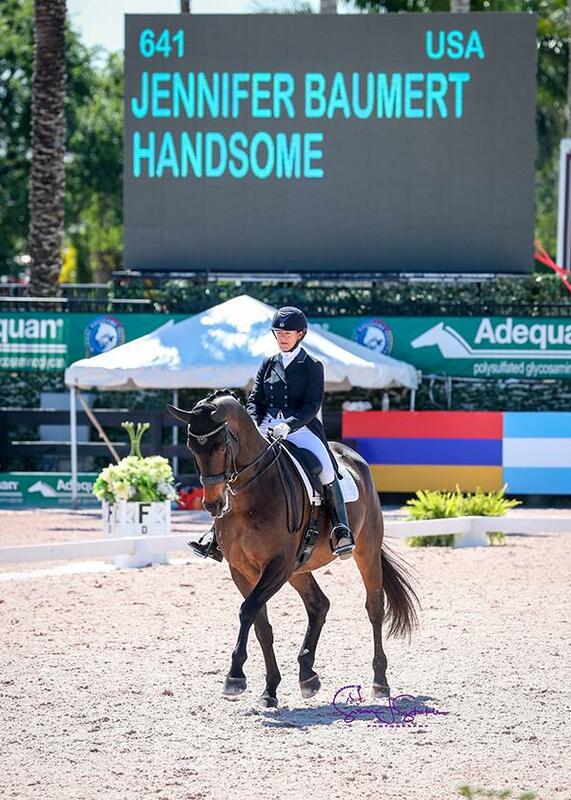 Jennifer Baumert and Handsome. Photo by Susan J. Stickle. When Baumert first started riding for Juliano, she sat on each of Juliano’s horses, but her first ride on Handsome stood out. “I’ve also had judges comment that he’s handsome, and then they look down at their sheet and say, ‘Oh it is Handsome!’,” she added. With her eyes on competing at the FEI World Equestrian Games in Tryon, North Carolina, Olivia LaGoy-Weltz has been working to bring Lonoir to the next level. 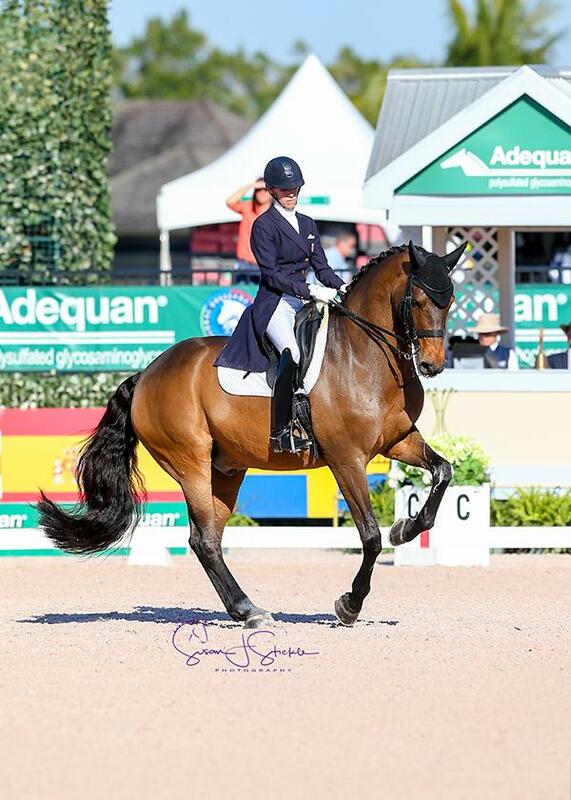 She’s well on her way with two more wins at AGDF in the CDI**** Grand Prix (73.78%) and the Grand Prix freestyle (76.60%). 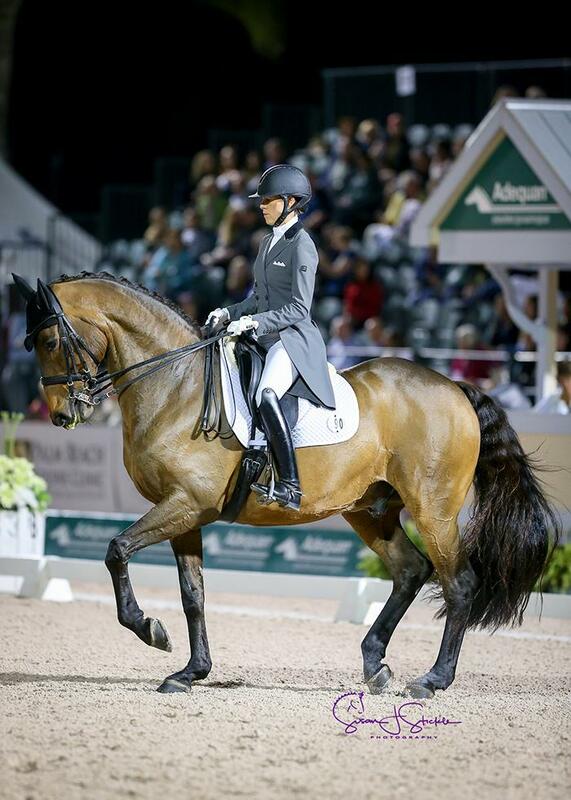 Olivia LaGoy-Weltz and Lonoir topped the Grand Prix CDI**** and Grand Prix freestyle. Photo by Susan J. Stickle. 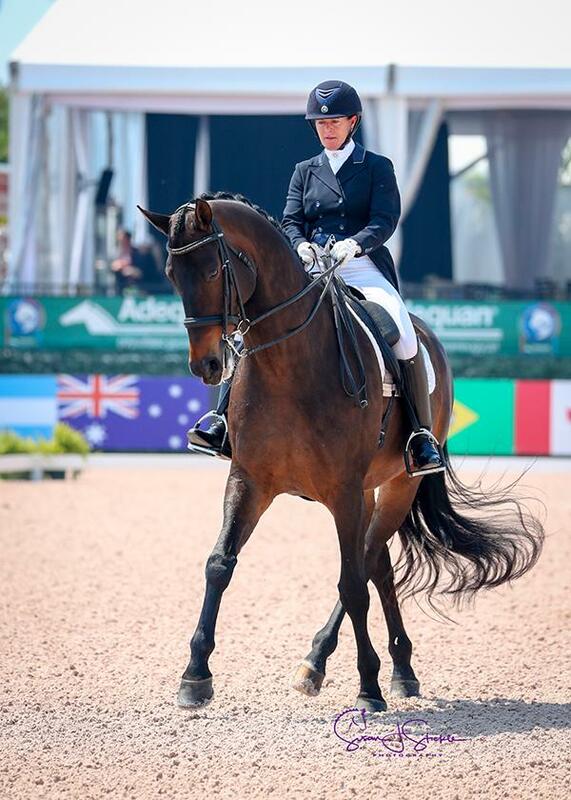 While in Wellington, LaGoy-Weltz is keeping her 14-year-old Danish Warmblood gelding by Le Noir with Oded Shimoni and is taking lessons with Debbie McDonald, and she said she’s benefiting immensely from the extra eyes on the ground. “If I’m riding at Oded’s then either he or Robert [Dover] is keeping an eye on me, so the past few weeks I haven’t been allowed to get off the straight and narrow. Olivia LaGoy-Weltz and Lonoir. Photo by Susan J. Stickle. LaGoy-Weltz’s freestyle music is an adapted soundtrack from her small tour days, but she’s working on a new one to debut in their next performance. Beatrice Marienau’s Stefano 8 might be the oldest horse competing in the CDI*** at 19, but he’s showing no signs of slowing down. He topped the Grand Prix on a 68.17 percent before winning the Grand Prix freestyle with a 72.10 percent. The German-born 47-year-old American is an unlikely dressage winner, having formerly showjumped, then become a cowgirl on a ranch, before finally turning to dressage despite what she terms “ring-phobia” that requires her to meditate before each test. Beatrice Marienau and Stefano 8. Photo by Susan J. Stickle. 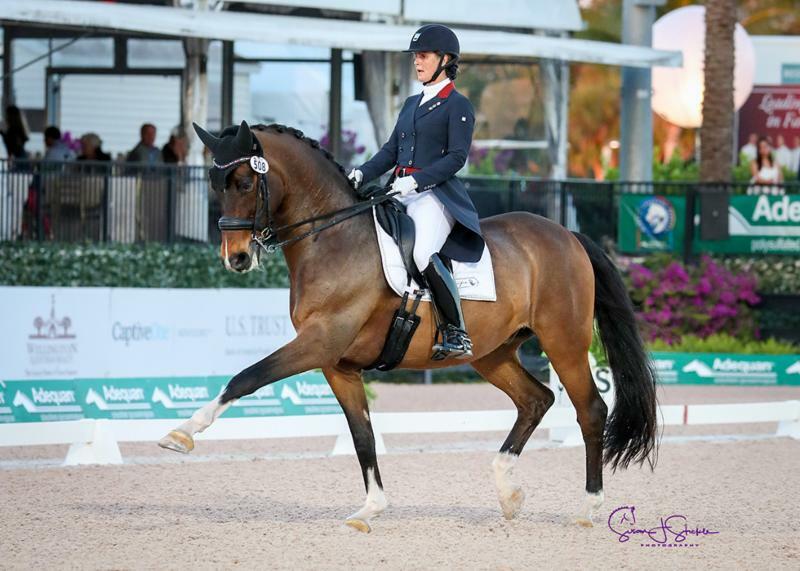 Shelly Francis is set to head to the FEI World Cup Final in France in just a few short weeks, so she’s focused on ensuring Danillo is feeling ready to shine. And it’s working with a 73.97 percent-a personal best-earning them the win in the Grand Prix Special CDI****. Shelly Francis and Danillo. Photo by Susan J. Stickle. On April 1, Francis will make the journey over to Europe with her two top horses, Danilo and Doktor. She will be based in Warendorf, Germany for the summer.